Labra-dude-le: Obi sports Doggles designed by Roni Di Lullo. Roni and Ken Di Lullo knew something was off when their dog Midknight kept missing the Frisbee during a game of fetch. In 1997, during a visit to the dog park near their San Jose, Calif., home, the couple noticed that Midknight was squinting. "He seemed to be sensitive to sunlight," Roni recalls. On a lark, Roni retrofitted sports goggles to fit the border collie. In addition to improving his Frisbee performance, Midknight became the talk of the dog park. People were so amused by the goggles that Roni created a website to showcase photos of the pooch modeling his eyewear. "People love to see a dog wearing glasses," she says. To her surprise, requests started coming in from other dog owners. "I had a full-time job [as a software developer] and never planned to do this as a business," Roni says. For each new order, she purchased a pair of sports goggles and revamped them to fit the four-legged customer of the moment. As sales grew, she realized her DIY method for creating what she had come to call "Doggles" was unsustainable. The Di Lullos consulted eyewear manufacturers about developing prototypes, but the sizing didn't work for dogs. Then a company in Taiwan agreed to make a custom product with a wide nose bridge and deep lens cup. In 2002 the couple placed an initial order for 30,000 pairs. In the midst of product development, Doggles were featured on DailyCandy and CNN. Soon after, PetSmart agreed to stock them in its stores. "That gave us the push to really make a go of it," Roni says. 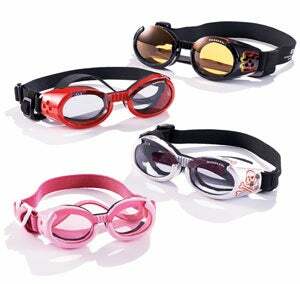 Doggles makes two models: Originalz and ILS with interchangeable lenses. Both are designed to fit a range of pooches, from Chihuahuas to Great Danes. The designs have shatterproof, anti-fog lenses that block 100 percent of UV rays, and adjustable head and chin straps that keep the goggles secure on the dog's head. In addition to PetSmart, Doggles sell for $16 to $20 per pair at Petco, Amazon and Target, as well as at 3,500 pet boutiques. The company also produces pet toys, clothing and other gear. The cute factor aside, Doggles aren't just a novelty item: A consultation with a veterinary ophthalmologist helped the Di Lullos see that dogs could benefit from protective goggles following eye procedures; Doggles even makes prescription lenses for those who have undergone cataract surgery and lens removal. Doggles are also part of the uniform of many service animals, including those used by the U.S. military, which has purchased more than 1,000 pairs in the last decade. "Their handlers aren't dressing them up to look cute," Roni points out. 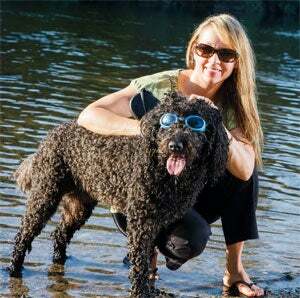 Expanding its vision helped Doggles reach revenue of $3 million in 2012. The growth has posed a challenge for the Di Lullos, who want to maintain a small-business culture while embracing new opportunities. But that concern is a walk in the park compared to the challenge they face every spring and fall, when Doggles introduces its new products and colors. In an effort to entice fashion-forward dog owners into buying, Roni lines up canine catalog models for a photo shoot. And getting the dogs to sit still is, as we know, harder than herding cats.